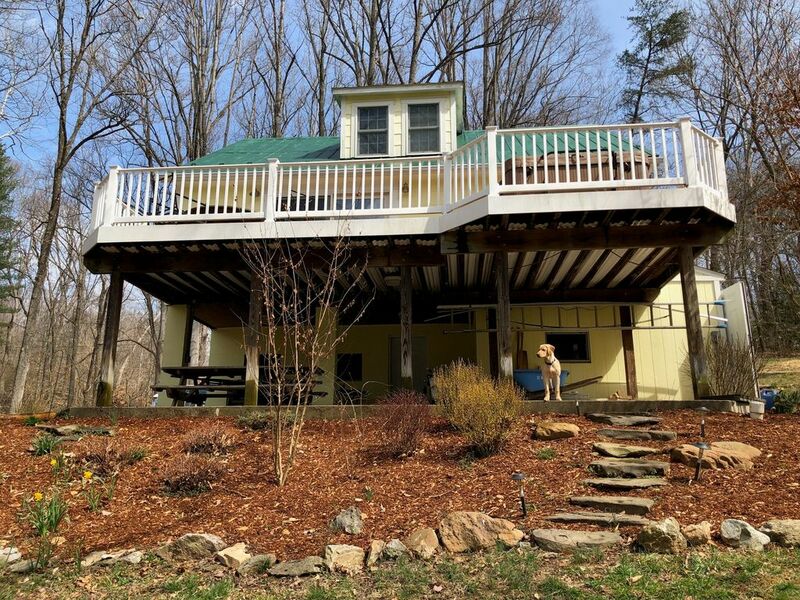 Venite a trascorrere un po 'di tempo nel nostro accogliente cottage di due piani su 2 acri a Sharpsburg, MD. Nascosto in un tranquillo cul-de-sac. Abbiamo molte attrezzature di sicurezza; Defibulatore, anidride carbonica e rilevatori di fumo ed estintori. Solo passi al fiume Potomac e C & O Canal Towpath. Porta la tua bici, in canoa o in kayak. Usa il pozzo del fuoco per arrostire i marshmallows. Portare scarpe da nuoto e nuotare nel fiume a Snyders Landing rampa a pochi metri dal cottage. Visita Antietam Battlefield a 2 miglia di distanza. Porta il costume da bagno e rilassati nella vasca idromassaggio. Vicino a: CharlesTown Races and Slots, Appalachian Trail, Cotoctin Zoo, Prime Outlets, Shephardstown WVa, Harpers Ferry, Crystal Grottos Caverans e molto altro ... City Water consegnata in cisterna, acqua non potabile. Forniamo acqua potabile, si prega di portare acqua potabile extra. Indicazioni: West sulla Capital Beltway I-495 - continua a DESTRA per prendere la I-270 N tramite la USCITA 35 in direzione di FREDERICK - Immettiti sulla I-70 W via USCITA 32 verso HAGERSTOWN - Prendi l'uscita US-40-ALT 49, verso MIDDLETOWN - Merge sulla US-40 ALT W - Svolta a sinistra su POTOMAC ST / MD-34 / SHEPHERDSTOWN PIKE - Svolta a destra su N Potomac ST. - Girare a SINISTRA su W Chapline St - W Chapline si trasforma in Snyders Landing Rd. - fine 16922 SNYDERS LANding - Yellow House. Atmosfera rilassante: questo è un luogo eccellente per rilassarsi e godersi la vita all'aria aperta. Godetevi la vista del cortile anteriore ben curato, Potomac River (inverno) e il C & O Canal Towpath dal grande ponte. La vasca idromassaggio è sul ponte ed è un posto davvero fantastico per sedersi e godersi l'ambiente tranquillo. È veramente tranquillo e buio di notte. Goditi lo swing del portico o rilassati sull'amaca! Ottima posizione: Siamo situati al miglio 77 sul C & O Canal Tow Path. Il fiume Potomac è praticamente nel cortile anteriore. Nelle vicinanze è presente una rampa di barca pubblica. Il campo di battaglia di Antietam si trova a 3 miglia dalla casa. Snyders Landing Road è un vicolo cieco, poco traffico. Siamo a 5 minuti da Shepardstown West Virginia. Shephardstown è una pittoresca cittadina universitaria con negozi e ristoranti specializzati nel campus dello Shephardstown College. Ora abbiamo INTERNET! Abbiamo anche tutte le attrezzature di sicurezza; Defibulatore, rilevatori di fumo e rilevatori di anidride carbonica. Abbiamo un pozzo del fuoco nel cortile anteriore. L'acqua è immagazzinata in una cisterna e preferiamo che non beva dal rubinetto. È sicuro per fare il bagno e lavare i piatti. L'acqua viene immagazzinata in un serbatoio di acqua da 2.000 litri che viene pompato nella casa. Proprio come a casa, ma l'acqua proviene dalla cisterna. Forniamo acqua di raffreddamento (acqua fredda / calda) e 2 bottiglie da 5 litri per acqua potabile supplementare. Perfect stay for the JFK50 mile race, loved it! This was the perfect long weekend. We arrived in a snowstorm, but the home was clean, welcoming and warmed up fast. I didnt even know when I booked it, but its right at the mile 34 aid station on the C&O of the JFK50 mile ultramarathon. So, I could get dry shoes and get some encouragement from my friend and dog. Enjoyed walks along the river before and after the race. The home was very clean and well stocked. Beds were comfortable and the hot tub was AMAZING. Really enjoyed some of the local places to Eat...Town Run was an awesome dog friendly tap house, restaurant, ,retro arcade with excellent food (Better than the press room by far!) and Antietam Creek Vineyards was a nice way to spend an afternoon (also dog friendly). Home owners made it easy! We didnt need to contact them with any problems, but they did reach out to check on us and make sure our stay was going well. Would stay here again for sure. Loved everything about this place! We had such a relaxing and fun time. Quiet place convenient to recreation. Despite staying over the time hurricane florence made landfall and brushed by my husband and I enjoyed enough good weather to ride bikes up the c&o canal trail to williamsport where there is a c&o canal trail museum, the next day we rode to harpers ferry and enjoyed the park and bike parking friendly restaurant. The trail is well maintained, only a few trees to negotiate fallen across it, and it is a very short distance to ride from the house to the trail at Snyder's landing. Those rides are about 16 and 20 miles total but virtually no hills. The tails were not overpopulated but had hikers and bikers, some scenery and wildlife. We would have kayaked Antietam creek but the water was swift and high so we visited the battle field, Washington monument and enjoyed the hot tub. Burkeholders bakery is excellent and easy to get to battleview market offers more variety then most little stores including some amazing fresh fried chicken! We had no issues with the water in the house, everything was comfortable and neat, the kitchen very useable. The deck is by far the nicest place to be with barely the noise of a car train or plane, just birds and breezes. The hot tub was awesome, we found three sets of instructions on using it and it did empty out for no apparent reason on the last day but it was new and clean and worked perfectly before that. We highly recommend! Super fun time, easy access to biking, tubing and swimming, enjoyed the hot tub too! Loved that all the bedding and towels were clean and fresh, water was provided and the kitchen was user friendly, we enjoyed our trip! Beautiful property, great house, so quiet - a perfect vacation spot. I highly recommend this property. The house has everything you need to spend relaxing days. Perfect for civil war buffs being so close to Antietam. We were there during a particularly muggy week, but the house has air conditioning, a great hot tub, and a beautiful deck. My husband and I, along with our dog Ed, had a great week and many good memories were made.